The Chicago band Twin Peaks dropped a series of song-pairs on vinyl singles in 2017. The singles were very limited releases so only a few hundred people got each one of these, or all of them. Now, Grand Jury Music is putting all 12 of the cuts out on a compilation called Sweet '17 Singles, and the set drops on Friday. That the release is, in some ways, more cohesive than the last Twin Peaks album proper is sort of a pleasant surprise. 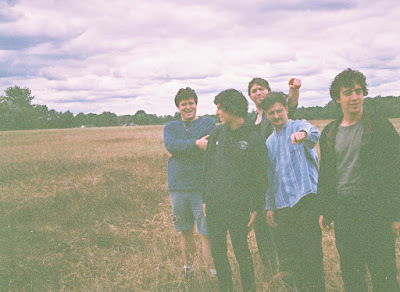 If tracks like "Shake Your Lonely" and "Blue Coupe" offer up bits of Stones-like lite swagger, the far better "Sun and The Trees" and "In The Meadow" reveal distinctive melodic hooks that suggest that the band have progressed beyond simply regurgitating Exile On Main Street-style rock dressed up in indie-pop trappings. If the brainy stonerisms of the band's very earliest records is long gone, at least a number like "Just Because" indicates that a new sort of lyrical alt-rock, full of ramshackle charm, has found its way into the band's set of tricks. On that song, and the Big Star-ish "On The Line", Twin Peaks succeed immensely, the Mick-and-Keef stuff now subsumed into the the group's very DNA. What that means is that these tunes are easy to love, and far more natural fits for the band than some of what was found amid the risk-taking of Down In Heaven. Utterly engaging, the things I loved about Twin Peaks a few years ago are back here on Sweet '17 Singles. The compilation, out on Friday via Grand Jury Music, is such a breezy joy to listen to that it's very nearly like hearing these cats for the first time. Sweet '17 Singles is out on Friday via Grand Jury Music. More details on Twin Peaks via the band's official Facebook page, or their official website.